Thank you to Congresswoman Roybal-Allard (CA-40) for co-sponsoring H.R. 485, The National Nurse Act of 2013. Congresswoman Roybal-Allard has always been a strong advocate for nursing and public health. She is known as a political pioneer and was the first Mexican-American woman elected to Congress. Before that, she represented the 56th Assembly District of California for six years. 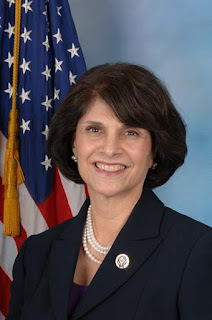 From Congresswoman Roybal-Allard's official government website: "Throughout her tenure in public service, Congresswoman Roybal-Allard has remained committed to expanding opportunities for residents of her district and working families throughout the country. She champions efforts to increase access to health care, create affordable housing, modernize and upgrade public schools, improve school safety, increase the federal minimum wage, reduce the high Hispanic drop-out rates, preserve Social Security and Medicare, and stimulate economic growth to create new jobs." “I was happy to sign on as a cosponsor to H.R. 485 The National Nurse Act of 2013. Nurses are the heart and soul of our health care system, and bring a holistic, preventative and compassionate lens to a system that has been stuck in a conventional sick care mode for too many years. Imagine what the health care system would look like today if nurses had been represented at leadership levels all along." Thank you to Working Nurse and writer Keith Carlson for featuring a story on The National Nurse of 2013 in April’s issue. Reading this article will provide greater understanding of the bill and its importance to nursing and public health. Congresswoman Eddie Bernice Johnson (TX-30), the first registered nurse elected to Congress, is the bill’s chief sponsor. Johnson states H.R. 485 would designate the chief nurse officer of the U.S. Public Health Service as the national nurse for public health in order to elevate the visibility of nurses. As Carlson mentions, “You don’t have to be political to be involved”. This proved true for nurse activist Audrey Bayer RN, BSN from Lambertville, NJ. Bayer joined the NNNO Advocacy Team this year and she has already visited with several lawmakers and their staff to urge support for H.R. 485, The National Nurse Act of 2013.